Our priority is to assist young men to achieve academic qualifications. 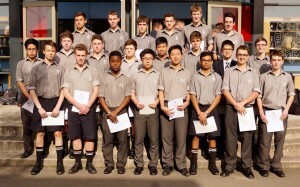 Our ultimate goal is for all young men to leave Palmerston North Boys’ High School on a pathway to their future career. The programmes on offer at PNBHS are wide ranging, from academic support programmes to NCEA examinations, vocational courses and Massey University papers. The academic opportunities available are extensive, and with focus and a dedicated approach to class work and homework, students can experience significant success. The School fosters a desire to learn, to participate, to compete at the highest level and above all, instils a desire in each student to reach his potential. We seek to provide our young men with an intellectual and moral education which will enable them to make a valuable contribution to our society. Click here to view our Academic Results. Our curriculum focuses on providing a broad base with an emphasis on literacy and numeracy at junior school, and allows for specialisation at the senior level. Palmerston North Boys’ High School have 13 different Departments and Services which assist the boys in achieving their greatest potential.